Divorce is never easy. The whole family unit is affected by a divorce, and when children are involved issues over child custody and parenting plan are bound to surface. These parenting issues become more complicated when both parents have similar work schedules or when great distances separate them. Attorney Ann LoDolce has over 34 years of experience negotiating parenting agreements and working out parenting schedules. 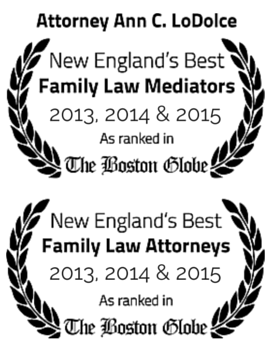 As with child custody, Massachusetts Probate courts always look to the best interest of the child, and there a presumption that a harmonious interaction with both parents is in the child’s best interest. Ann LoDolce would be happy to guide you in mediation based on her extensive knowledge of child custody and visitation matters.